Many families choose our own Jenkins Cemetery (formerly known as Startown Cemetery), conveniently located behind Jenkins Funeral Home. It began as a Community Cemetery in the 1800s and was taken over by Startown Baptist Church in the late 1940s and early 1950s. Jenkins expanded the cemetery in 2004 and has added special sections, such as the Green Burial Section and the "Garden of Angels" for infants. A copy of the Jenkins Cemetery Rules and Regulations is available by visiting our office. Seven Wilson family members whom fought in the Civil War were never properly recognized with headstones. The U.S. Government provided these stones and they were erected in our cemetery one hot summer day in 2006 by the local camp of the Sons of Confederate Veterans. Newton Wilson was the individual for whom the city of Newton was named. Rev. Dean Hart (Startown Bapt. Ch.) & Carl Jenkins (Jenkins Funeral Home) marked stone placement spots. Joe Brown, Wilson Reunion chairman and organizer, greets the ceremony attendees at the Wilson dedication ceremony. Capt. C.F. Connor Camp 849 Cdr. Ken Johnson explains purposes of the event. 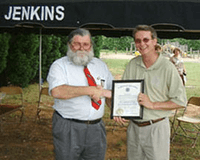 "Jenkins Funeral Home was instrumental in making this dedication ceremony a reality. 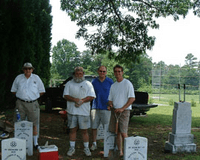 In addition, Carl worked alongside of SCV members preparing the site for the stones. When he could have simply have given his blessing to our project, he gave up an entire day working with camp members. On the day of the ceremony, he supplied tents and chairs to make the ceremony an unqualified success. The Wilson family and the SCV owe Carl Jenkins and his family and business a sincere debt of gratitude," says Derick Hartshorn. we can meet your needs..
We can arrange to transport and conduct services at any National or Veterans Cemetery. Click here to learn more.